Gareth pictured with the Amber Valley Ladies team. 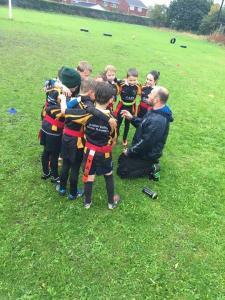 Rugby coach Gareth Pilkington, 44 from Riddings, combines his day job as commercial manager for the Corrugated Case Company in Clay Cross, with serving as chairman of Amber Valley Rugby Club. His role also extends to coaching Amber Valley Ladies RUFC and also junior sections at the club, meaning there's rarely a dull moment for the man who was a finalist at the 2016 Derby Telegraph Sports Awards. "I originally started on the coaching pathway whilst my eldest two children were at Heanor Swimming Club in 2002 when after a while was asked to step over the barrier and help out. "I found out that I thoroughly enjoyed it and continued becoming a qualified swimming instructor and life guard, coaching twice a week plus competitions on top of that. "The work I put in soon earned me the respect from the team members and parents and eventually I became chairman of the club. This continued until 2008-09 (by which time my children had already left the club) when other things in my life took priority and I had to give up. 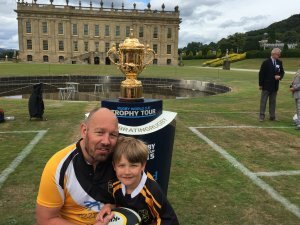 "The retirement however, was not to be a very long one and swimming was soon replaced with the sport which I have loved and played for nearly 30 years, rugby, where all my time had come at one club - Amber Valley. "This has since escalated, so the ladies are now in a development league and are training twice a week with a view to entering the full league system. "Not only have the number of ladies playing the game increased, we have also encouraged some of the men within the club to help them in their quest and join in coaching them, which, in my view, is as much a success as the women playing. "Like with the men and children's sections, we are actively growing the ladies and all are welcome to come and join in – no experience necessary! Gareth during his playing days. "Over the years at the club, I have always been involved in helping with various jobs around the place so, when was asked by a friend and team-mate in 2010 to come and help out with the running of the mini / junior section, and being as I wanted to give something back to the club, I said 'yes'. "Since then, I have gone on to become the chairman of the club, a position I have held for the past five years. 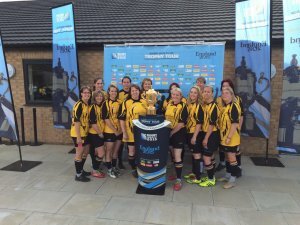 Being the chairman, I was approached in September 2013 about the possibility of us putting on some training for some ladies that were interested in doing some rugby specific sessions for the ladies. "With no-one else at the club in the frame or willing to do this, I said that I would run them. I had plenty of playing experience having played for the first team at Valley for over 15 years, spending two years at Nottingham Rugby in their Under-21s and playing representative rugby for the county at Under-18s, Under-21s, senior and veteran levels. "I currently coach three different groups, which are the Under 6s to Under-9s, which happens on a Sunday morning from 10 am to 11.30am, I help out with the Under-10 and 11s on a Wednesday night from 6pm til 7pm and, as mentioned above, with the women twice a week, on a Thursday night 7pm to 8.30pm and a Sunday from 1pm tp 2.30pm. "As well as coaching I have also been recruited to help within the three counties set up coaching the ladies team who went unbeaten in their programme last year. "This is a two-year secondment, so I will be repeating this again this year. The team achieved promotion last year so the rugby will be more intense, but we will have an enjoyable time in helping to preparing the players for this challenge. "When I was asked to start helping it was the younger children where my affinity was immediately aligned, partly as I had a two-year-old at the time and I hoped that he would one day join. "I was keen to create a welcoming environment where the kids want to come down to the club, but at the time it was all guess work as to what was right or wrong. "I have developed a real passion in trying to ensure that the kids I coach enjoy themselves and have strived to ensure that with planning, empathy, understanding and most of all creating fun sessions the kids we coach are keen to come back. "Without realising, they have learnt about many of lives key skills, ones that are key to the core values that are held in such high regard throughout the rugby community, skills that are being continually honed and are so valuable in life in general as we all get older. "Being able to bring these to the fore is something that I am really proud of being able to promote and achieve." Gareth's coaching journey has helped him make life-long friends. "Seeing people enjoy themselves, grow in confidence and self esteem and learn – no matter what ability they have or start with – is what I enjoy most about being a coach. "One thing that is not really coached, but happens when a club is creating the correct environment and one that has been a big thing for me throughout my rugby career, is that of making life-long friends and seeing these start, grow and develop. "To my mind the first coach you get, no matter what sport or activity it is you play or undertake, is normally (parental influences aside) the one who has the largest impact on whether you continue in that sport or not. "They are the one that grabs your attention and inspires you or puts you off for life. Grass roots clubs being the most likely initial access point are continually on the lookout for good people to help promote their sport and encourage people to come in. "It is in their own interest to ensure that these are the best that they can possibly be, otherwise the decline in numbers has a particularly gruesome effect and we end up with fewer clubs and eventually a decline in the participation overall. Interest in the ladies team has grown quickly. 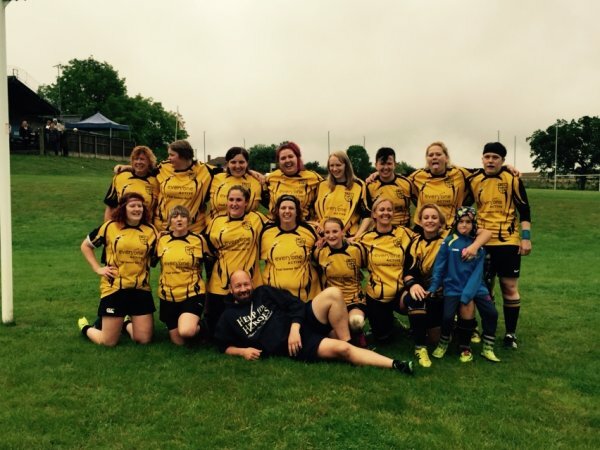 "From the start, the ladies team, which I am proud to be a part of, was not something that was on the radar before we were approached by a member of staff of the Amber Valley Village Games with a proposition about us getting ladies involved in doing some exercise using rugby based activities. "Getting this idea sold was not a difficult thing and originally this was undertaken by immediate members of the club and they encouraged their friends to come along. "At this time, there was no intention to get the ladies to play the sport, but purely to get out and get fit. Once the ladies got involved it was them who drove the growth and them who decided they wanted to take things forward into the sport itself. "I do believe that being the chairman of the club and also having other senior members of the club management committee undertaking the coaching ensured that it was easier for them to be incorporated into the club and become part of it. "With these figures in place and being so positive in their actions getting women to buy into the activity was comparatively easy." "What keeps me motivated is the fact that I can facilitate someone else's enjoyment and help them improve and achieve something that they never thought possible. "Getting people to buy in to what you are trying as a team to achieve and the relationships and trust in one another that are built as a result. It's also because I can't play again and want to put back into the game some of the knowledge I have accumulated." 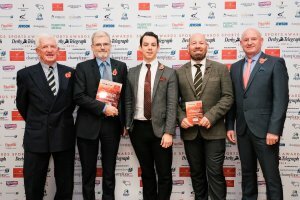 Gareth (second right) is recognised at the Derby Telegraph Sports Awards. "I was completely unaware that I had been nominated in the first place I was over the moon to have got as far as i did in reaching the final. "For someone to have taken the time to put me in for the award in Amber Valley in the first place was wonderful - and to have won that part was brilliant. "It shows that you don't have to be a full-time paid coach to get some sort of reward and recognition. "I have already started on my future progression in the fact that I am on my way to becoming a level 2 coach. "Learning more means that the ladies team are continually developing which means they are asking more questions, which means that they are learning and I then need to learn more to keep this cycle going. "I am continually looking to improve and I am constantly having to look at new ways of changing what we do but to want make sure that I am one step ahead of them. "My advice to others thinking about coaching or volunteering is to ensure that you love the sport and believe in what you are trying to get across. "Be open and honest about your aims by sitting down with the group you are coaching and setting goals and getting to the heart of what it is they are trying to achieve. "Lastly, be open to getting ideas from others and not just the sport that you coach in and try and go on as many courses as possible. Don't be afraid of learning new things or making mistakes - after all, we are all human."